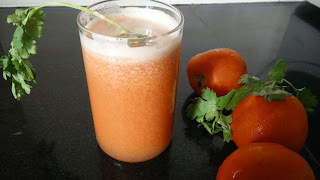 Tomato and apple juice is a very healthy juice which is excellent for the skin. This juice is especially effective for women. Vitamin C and Vitamin A makes the skin look beautiful. So have 1 glass of this juice everyday and see the results…. 1. Put tomatoes and apple in Philips Quick Clean juicer and add lemon juice and rock salt to it. Add ice cubes if required. Serve chilled.